Kirkintilloch Rob Roy boss Stewart Maxwell (centre) is optimistic about the club's future prospects. Rob Roy’s game with Beith at Guy’s Meadow may have been postponed on Saturday - but it was far from a weekend off for boss Stewart Maxwell. 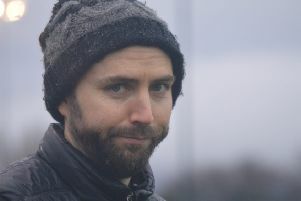 He managed to organise a Saturday morning training session, signed three new players - and on Sunday watched the club’s under-19s reach the semi-final of the Scottish Cup for the first time ever. The youngsters booked their spot in the last four with a 2-1 away win over Vale of Leven. A delighted Maxwell said: “It’s great for them and great for the club. “I’m really proud of them and delighted for the players and the coaches. There’s a big day looming for the club. With Rabs hoping to move into their new home next to Lairdsland Primary by the end of the year, Maxwell feels the future is bright for the club. 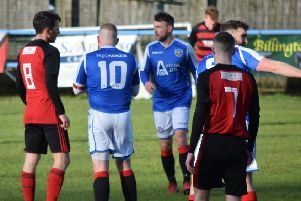 The Rob Roy boss has already started shaping his squad for next season and confirmed the weekend signings of keeper Ian Stewart and left wing-back Lewis Kinnaird from Cambuslang Rangers and defender Scott Forrester from Albion Rovers, as well as agreeing a new deal with current midfielder Jordan Currie-McLean. Maxwell said: We’re looking like a good, strong squad again. “The three new guys are hungry and have signed 18-month contracts, so they’re committed to next year. Jordan McLean is also committed for next year as well and an exciting prospect going forward. “We’re starting to build for the future and going into the new park will be a positive for everybody that’s going to be there. This Saturday Rabs play Troon away.